MTA Bus Time integrates a number of proven technologies to bring real-time information to riders. The result is a system that delivers great results to our customers while being highly cost-effective, fast to deploy, simple to maintain and operate, and supports expansions in the future as time and money allow. The two main parts of the MTA Bus Time system are the on-bus hardware and the MTA Bus Time server. The delivery of each of these was tailored to the project's specific needs and to meet the broader MTA's strategic technology goals. The simplest way to sum up those goals is "Open." First and foremost, the MTA BusTime system is open to external developers to create their own real-time bus applications using the Bus Time data feed. If you would like to learn more about developing applications using Bus Time, read more about the MTA Bus Time Developer API. It is also open internally, in terms of how the different pieces of technology fit together. This gives the MTA maximum flexibility with regards to who supplies the on-board hardware (which reports each bus' position), who develops the MTA BusTime server (which puts all the information together and responds to users' requests), and what other applications the MTA Bus Time system can support in the future. One goal of the project was to demonstrate that the same type of hardware used in our Smart Card Pilot Program can support the MTA Bus Time system. This would allow the MTA to save time and money by installing a single set of hardware on buses to meet fare payment and real-time bus tracking needs. To implement this, for both the pilot on the B63 route in Brooklyn and the rollout to Staten Island and The Bronx, the MTA partnered with VeriFone, who supplied the on-bus hardware for the MTA's Smart Card pilot. This hardware solution used open standards implemented by commercially available off-the-shelf (COTS) products. These include the VeriFone TransitPay MX-700, a small, rugged, and highly secure on-board computer terminal to record and process the data, and the Sierra Wireless AirLink GX400 cellular gateway to transmit the data over Verizon's 3G wireless data network. In keeping with the MTA’s policy to have at least two suppliers, for Manhattan, Brooklyn, and Queens, the MTA has partnered with Cubic Transportation Systems to supply an alternate set of hardware. This includes Cubic's "Mobile Validator" rugged terminal, and the CradlePoint IBR-600 cellular gateway to transmit the data over Verizon's 4G wireless data network. To report the bus' location. The MTA's partners add one of two enhanced GPS devices: the Placer Gold, or the A3000, both supplied by Trimble. This rugged, standalone component has multiple industry standard interfaces and uses "dead reckoning" to compensate for lost or corrupted GPS signals in New York's "urban canyons." While good GPS signals can be obtained for the B63 route and the routes in Staten Island, it was important to demonstrate that this approach would work in all of New York City. 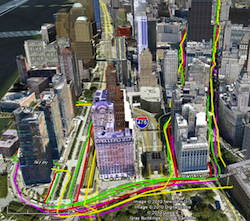 The accuracy of the enhanced GPS device was validated, even in Manhattan's worst urban canyons, through testing by MTA engineers in conjunction with a joint research team from Columbia University and the City University of New York. What happens on each equipped bus is simple - every 30 seconds, the terminal collects the enhanced GPS data and information about what is displayed on the bus' external destination sign. It then sends these data, via the 3G/4G wireless modem, to the MTA Bus Time server in an open-standard format. All the complexity resides on the Bus Time server. It is this simplicity of design for the on-bus hardware, that sets MTA Bus Time apart from other real-time bus tracking and customer information systems and allows it to work with standard payment processing hardware. This is where the magic happens. Approximately every 30 seconds, the MTA Bus Time server receives the information described above from each bus in the Bus Time project. The server integrates this information with map, route, and schedule data, as well as previous real-time updates. The server then applies sophisticated inferential algorithms to determine whether the bus is in or out of service, what route it is serving (if any), if it is on a detour, and its direction of service. Based on these inferences it then determines what stops the bus is going to make and how far the bus is from each stop. At that point, the MTA Bus Time server simply makes this information available to users in a number of different ways - via a desktop web map, a mobile web site on iPhone, Android, BlackBerry, or other smartphones, and via SMS on all mobile phones. It also provides an API for developers to create their own applications and interfaces to use the Bus Time data. The MTA Bus Time server is powered by the OneBusAway Open source software package. This software was originally developed to aggregate real-time information from multiple bus and ferry operators in the Seattle area and make it available to Seattle's transit users via a range of internet and mobile interfaces. OneBusAway uses as its baseline information transit schedules published in the GTFS format, which the MTA is already publishing for all of its bus and rail services. 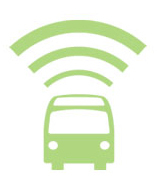 Since OneBusAway is Open Source software, the MTA is able to use it free of charge. Bus Time required a number of improvements and customizations to OneBusAway, for which the MTA partnered with OpenPlans for the pilot, and with both OpenPlans and Cambridge Systematics for the rollout. All of these improvements have been contributed back to the OneBusAway project, and are now publicly available and free for any other developer or transit agency to use. The MTA Bus Time team and partners offer their viewpoints on the project in this behind-the-scenes video.